Felted with locally sourced wool, this prickle-free pillow adds a touch of whimsical Southwestern style. What's a cactus to do, when all it wants is a little cuddle? Make a move from the desert to your comfy couch or bed. Felted with locally sourced sheep's wool, this prickle-free pillow adds a touch of whimsical Southwestern style to your decor. Handmade by Gulnara Kydyrmyshova in Kyrgyzstan. Round: 10" H x 10" dia. ; Tall: 12.5" H x 8" dia. 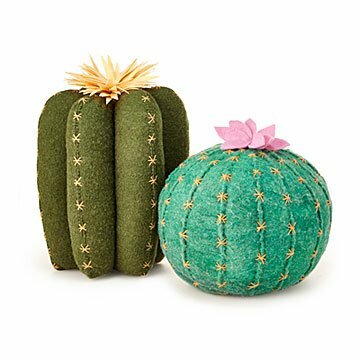 These pillows are too cute and I wish whoever is making them would come out with more styles of cactus for me to purchase. I would love to have several more of these in different styles. These pillows are unlike no other. I love the quirky cacti! This completes the sofa. It adds style and comfort! I wish there were more designs to buy! Love this pillow and all it adds to our room! We have it in the kid's teepee where they love to play with it and lay on it. It's so simple and classy! These are very cute. Would love to see more styles. Wish they were about 20% bigger, but overall very pleased with these. Looks really adorable on my entryway bench! I ordered both cactus pillows for my entryway bench and they look adorable. They have already received compliments from visitors as they are very unique. I would definitely recommend. The only slight downside is the smaller cactus arrived very squashed. I've had to play around with it to get it back in shape. Otherwise very happy! Love love love this cactus throw pillow! My friend moved into a new, larger apartment that's a little sparse, so I bought her the small cactus to spruce up her living room. The vibrant color brightens the mood of the living room, and adds a creative flare to the decorative scheme.